On most days, hiking is a labor of love. It’s typically a relaxing walk outside where you may encounter a moderate elevation gain and you’re home by dark. Then there are the type of hikes that literally take your breath away, and not in a good way. These are hikes by definition, but more of bucket list adventures found in all corners of the globe. These 11 hikes that offer the most magical views and terrifying portions of trails that the globe has to offer. You’ll be scaling mountains in China, traversing treacherous terrain in Utah, and wandering through the mountain jungles of Peru. Hold your breath and close your eyes, you’re in for a white-knuckled journey around the world. Not for the faint of heart, this is widely regarded as the most dangerous hike on the planet. 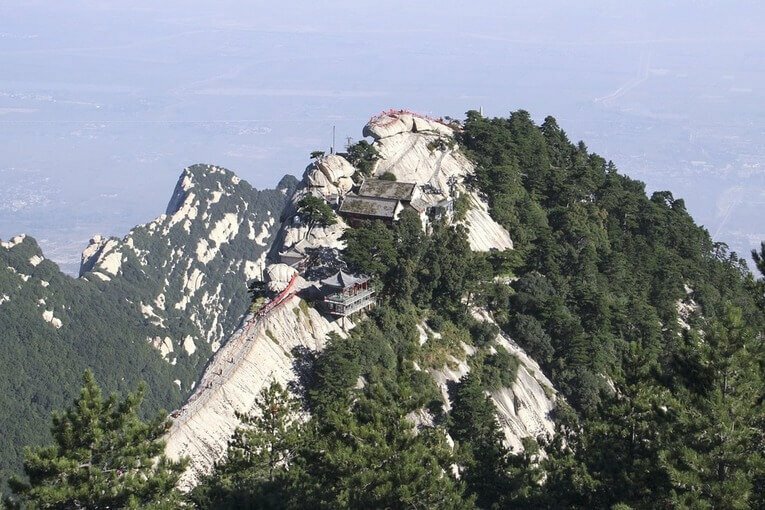 This trail is found on Mount Huashan, or Mount Hua close to the city a Huayin which is the home of the famous Terracotta Warriors. While no official records are kept, it is thought that as many as 100 people fall to their deaths each year (source). With names like the Thousand-Foot Precipice, Hundred-Foot Crevice, and Black Dragon Ridge there are no words to describe the sheer drop offs that you’ll face. The path is littered with steep staircases, vertical ascents, and rickety planks set into the side of the mountain to conquer. If you can stomach the death defying cliff faces and rickety wooden pathways loosely bolted to the mountainside, there is a tea house that sits 7,087 high on the mountain. Via Ferrata, or “iron path” in English, is a harrowing hike through the Dolomites in Italy. The hike takes you down a route that has built-in protection in places to keep you from falling and aids you in your trek through the mountains. Originally established during World War 1 to aid the progress of soldiers through the mountains, this path is not for everyone. While the remnants of the original path is lost to history, the hike and climbing portions are still maintained by the Italian Alpine Club (source). 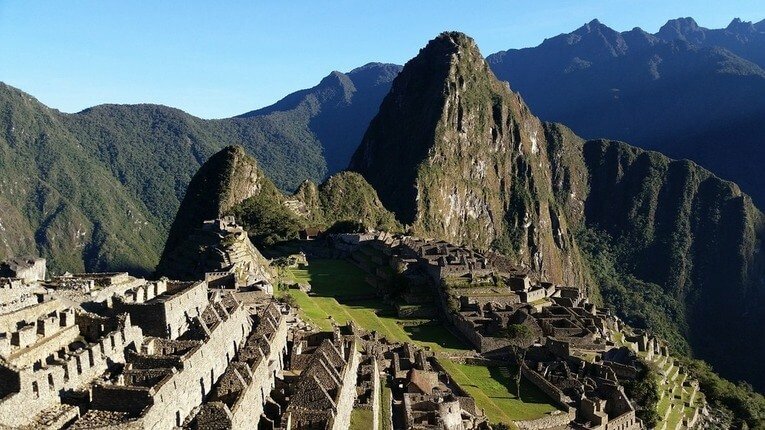 The Huayna Picchu is located in the mountains North of Machu Picchu, the world famous Incan Archaeological site and sits at 2,720 meters above sea level. You have to register for the hike beforehand and only 400 people each day are allowed to make the trek. The most challenging and dangerous section of the trail is the “stairs of death”. 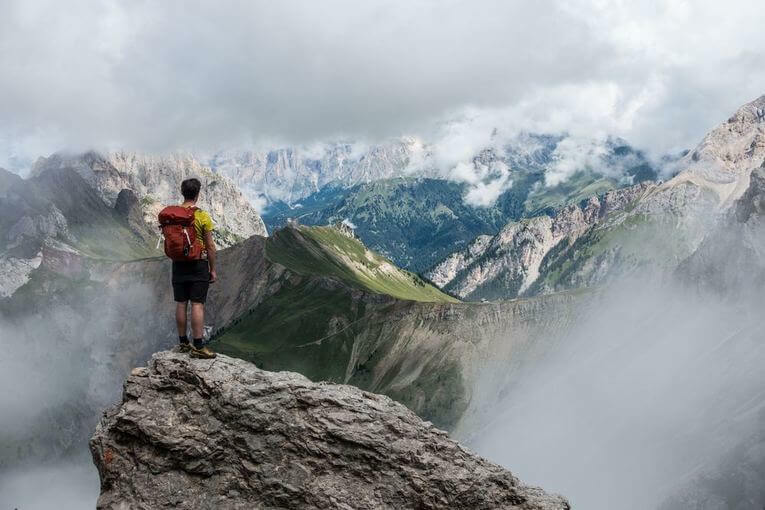 In order to reach the peak of the mountain, you must climb a set of concrete stairs with no handrails that reach an angle of up to 60° at some points. While the stairs themselves are not a death sentence, it’s the psychological battle that each person faces while making the last climb that’s the most dangerous. One of the stats that is often repeated is that before 1985, 55 people lost their lives attempting to complete this trail. The Drakensberg Traverse is a 240-kilometer hike that crosses the Drakensberg mountain range in South Africa. It’s a daunting trek that covers some of the most beautiful and treacherous alpine terrains in the area. This trail has no designated path or established trail along the way and due to the dangerous nature of the hike, a local guide is highly recommended. It requires hiking, climbing, and scrambling along the way and that may not even be the most dangerous obstacle you encounter. There have been reports of people being attacked by assailants with dogs while attempting this hike. Angel’s hike is located in Utah and is one of the classic hikes in the Zion National Park and the payoff is one of the most powerful views in the United States. It’s a 5-mile hike that takes roughly 4 to 5 hours to complete from trailhead to summit and back. It’s a challenging hike with extremely steep sections of rapid elevation gain, full sun exposure, and scrambles. 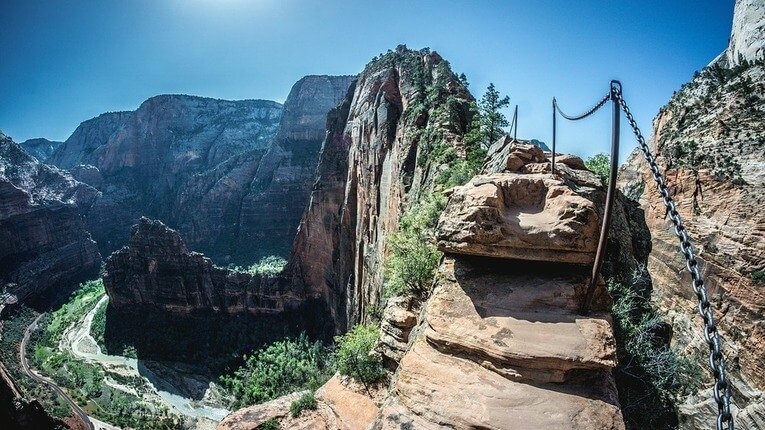 By far, the most hair raising portion of the hike is the knife edge ridge that takes you straight up to Angel’s Landing. If heights aren’t your thing, don’t look down, there’s a sharp 1000 foot drop off just beyond the handrail. This hike requires both mental and physical fortitude, as you travel the long and narrow pathways with deep canyons all around you. You may not be familiar with The Maze in Utah, however, you most likely have heard of or seen the Movie 127 hours which takes place in The Maze. It’s the most remote area of the Canyonlands National Park due to the challenging roads and its remote location. The trip also requires you to pack all your own water and food since resources are few and far between. It’s a red rock maze of towering red rocks and deep crevasses to constantly navigate. There is the constant risk of falling rocks and flash floods as demonstrated in 127 hours. Park rangers are happy to remind visitors that “this is not the place for inexperienced hikers.” n 2016 the maze had 11,352 visitors compared to 595,698 that visited the Island in the Sky (source). Needless to say, this hike is not for the faint of heart. 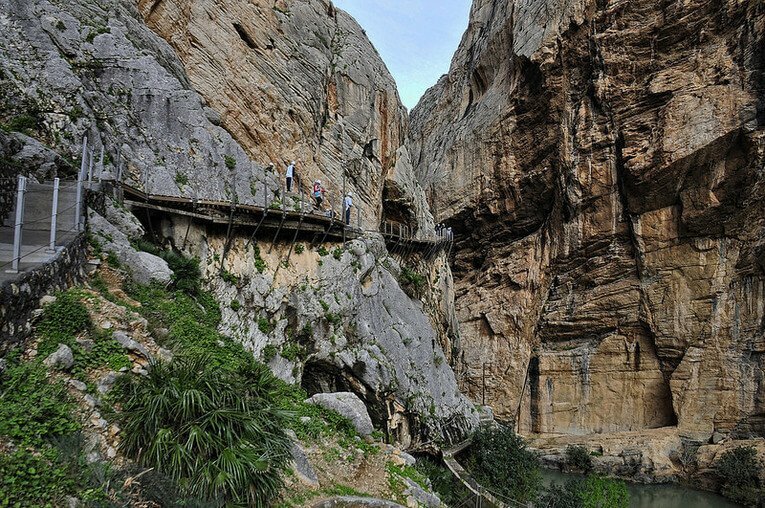 Known as the most dangerous path in Spain and one of the most dangerous walkways in the world. El Caminito del Rey is in a remote corner of Andalucia in the South of Spain it’s s a 3-kilometer hike that has become more of an adventure sport than a casual hike. At one point in time, it was a little known secret among rock climbers and adventure enthusiasts. Throughout the hike you’ll encounter numerous parts of the walkway where the concrete has collapsed, exposing the sheer cliff face below and steel supports that used to hold the concrete pathway. There is a steel cable that runs the length of the path that you can clip into, however. it’s not officially maintained so use it at your own discrepancy. From 2001 to 2015 it was closed to the public after 5 tourists fell to their death and have since been fully restored and is much safer than it has been in the past (source). While this hike may not be the most dangerous in terms of high cliffs, falling rocks, and flash floods. The real danger on this “bucket list” hike is the fact that you’re hiking on an active volcano. The most recent eruption took place on June 7, 2018, with lava flow that was approximately 50 meters long and 20 meters wide (source). Throughout the hike, you’ll hear the rumbles of the volcano and feel the vibrations beneath your feet, but don’t worry this is normal! The hike itself is a well-marked trail that goes directly up the volcano and is considered a moderate hike. Overall, it’s awesome to hike on a volcano and check off a mark on your bucket list, just keep in mind, this is one of the most popular tourist destinations in Guatemala and you won’t be alone. Half Dome is one of the most iconic locations in American National Parks and rises 5,000 feet above Yosemite Valley and 8,000 feet above sea level. Every year, thousands of people make the effort and reach the summit, however, every year park rangers assist hundreds of people in emergency situations. While most of these emergencies could have been avoided with a little preparation and understanding, nonetheless, the dangers on this hike are real. The most famous portion of the hike is 400-foot climb while holding onto steel cables to ultimately reach the peak of the hike. 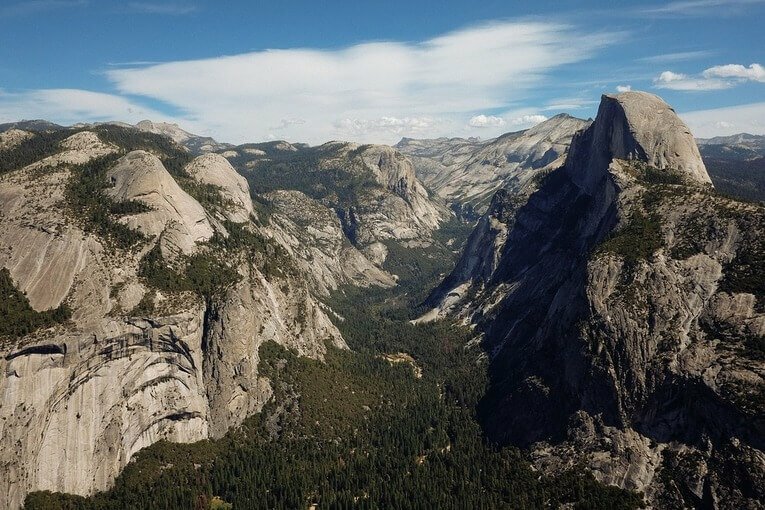 4,800 feet of elevation gain on your way to the top of Half Dome will take your breath away, literally. Most people take 10-12 hours to hike the entire length of Half Dome and beginning early in the day will ensure you return before dark. While this hike is full of physical and mental challenges, the view is unparalleled and the juice is worth the squeeze. The Aonach Eagach ridge is found in Glen Coe in western Scotland and makes up a portion of the Scottish Highlands. The peak of the ridge towers high, sitting at 953 meters high and is considered the United Kingdom’s most challenging ridge hike. The ridge has seen a number of deaths in the last 10 years, so caution must be taken. The ridge portion of the hike is 6 miles long and has drop-offs that will make the most confident climbers question their decision. This hike is rated as a grade two scramble including exposed sections with sheer cliffs and terrifying ledges. In order to complete this hike, it’s highly recommended that you’re an experienced hiker, otherwise, there’s a chance you may freeze with nowhere to go but down. The Kalalau Trail is a 22-mile roundtrip hike found on the island of Maui in Hawaii. 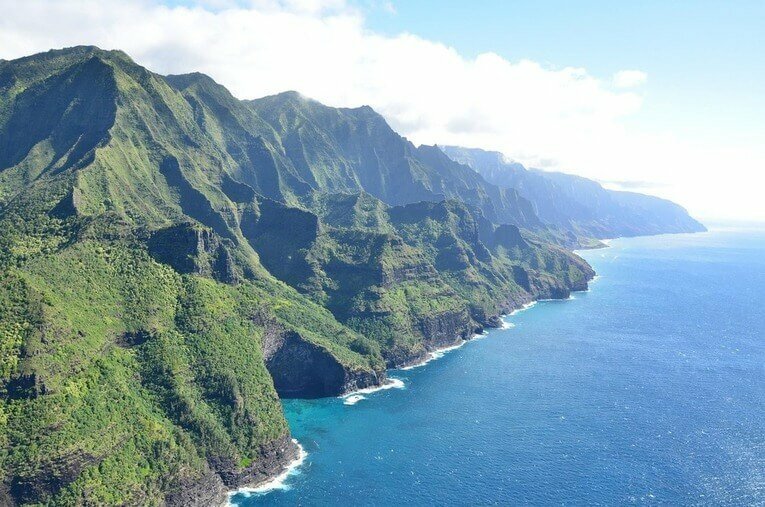 It runs along the Na Pali Coast and takes you from Ke’e Beach to Kalalau Beach which has some epic camping once you complete the trip. Permits are required to camp on the beach and if you hike past Hanakapi’ai, but as long as you don’t hike past Hanakapi’ai there’s no permit required. This trail is currently closed due to landslides and is planning on reopening in January of 2019 (source). After the first leg of the trail, the hike becomes increasingly remote and dangerous. There are switchbacks along the trail and ridges that look straight down to the rocks and water below. The tropical rain that hits the Na Pali Coast is the biggest danger, often causing flash floods and extremely treacherous conditions.